When the Windows 8.1 update comes to the Windows Store later this year, Outlook RT will join Word, Excel, PowerPoint, and OneNote as a free app on Windows RT systems. That is huge news in general, but it’s particularly intriguing for business users. The Surface RT (and Windows RT tablets in general) is a decent tablet, but it's not a great device for business computing. It has distinct advantages over its Surface Pro sibling—it’s thinner, lighter, cooler, quieter, and has significantly better battery life—but it can’t join a Windows network domain. The availability of Office could change the trajectory of Surface RT sales. With the Windows 8.1 update, it still won’t be able to join a network domain, but the IT and BYOD management features in Windows 8.1 make it much more business friendly. The addition of Outlook is the real game changer, though. The default Mail client in Windows 8.1 is no match for Outlook, and business users need consistency between the tools they use on their primary PC, and the apps available on the Windows RT tablet. Earlier this year, Nvidia CEO Jen Hsun Huang told an audience of financial analysts, "If Outlook were to show up on RT, my life would be complete," adding, "I am one Outlook away from computing nirvana. Outlook god, please…"
Assuming the “Outlook god” means Steve Ballmer, Huang’s plea apparently did not fall on deaf ears. The minions…I mean Microsoft developers…have heard Huang’s prayer. Microsoft has engineered Office 2013 to be more touch-friendly than previous versions, but it still falls into desktop mode, and it is harder to work with on a touchscreen display than an app designed specifically for Windows 8—like OneNote MX. The Touch and Type keyboard covers are effectively a part of the Surface tablet experience, so Surface RT users still have a touchpad and physical keyboard to work with. 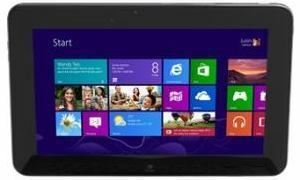 But, most other Windows RT tablets don’t have that benefit and are used purely as touchscreen tablets. OneNote MX, with its radial menus, offers a far better experience than OneNote 2013 when working with a touchscreen display. It doesn’t appear to be part of this update, but Microsoft should be working on developing dedicated Windows 8 MX versions of all of the Office apps. Office is a powerful carrot that Microsoft hopes will lure customers over to Windows tablets—be they Windows RT or Windows 8 Pro models. The addition of Outlook is a significant advantage for Windows RT tablets, but even if Windows RT doubles…or even triples its market share, there will still be a massive audience of iOS and Android tablet users left in the cold. It’s possible the leaked roadmap was simply wrong. Assuming it was legitimate, the accelerated availability of Outlook RT suggests a spark of hope that Office for iOS and Android will also be available earlier than anticipated. I’ve asked Microsoft whether or not that’s the case. If Microsoft is working on iOS or Android versions of the Office apps, it's still being coy about it. The official response I got was, "We have a great Office experience on Windows 8 tablets. For iPad and Android tablets, people can use Office Web Apps."